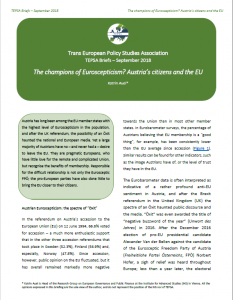 TEPSA is happy to present its new policy brief “The champions of Euroscepticism? Austria’s citizens and the EU” written by Katrin Auel, Head of the Research Group on European Governance and Public Finance at the Institute for Advanced Studies (IHS) in Vienna. Austria has long been among the EU member states with the highest level of Euroscepticism in the population, and after the UK referendum, the possibility of an Öxit haunted the national and European media. Yet a large majority of Austrians have no – and never had a – desire to leave the EU. They are pragmatic Europeans, who have little love for the remote and complicated Union, but recognise the benefits of membership. Responsible for the difficult relationship is not only the Eurosceptic FPÖ; the pro-European parties have also done little to bring the EU closer to their citizens.